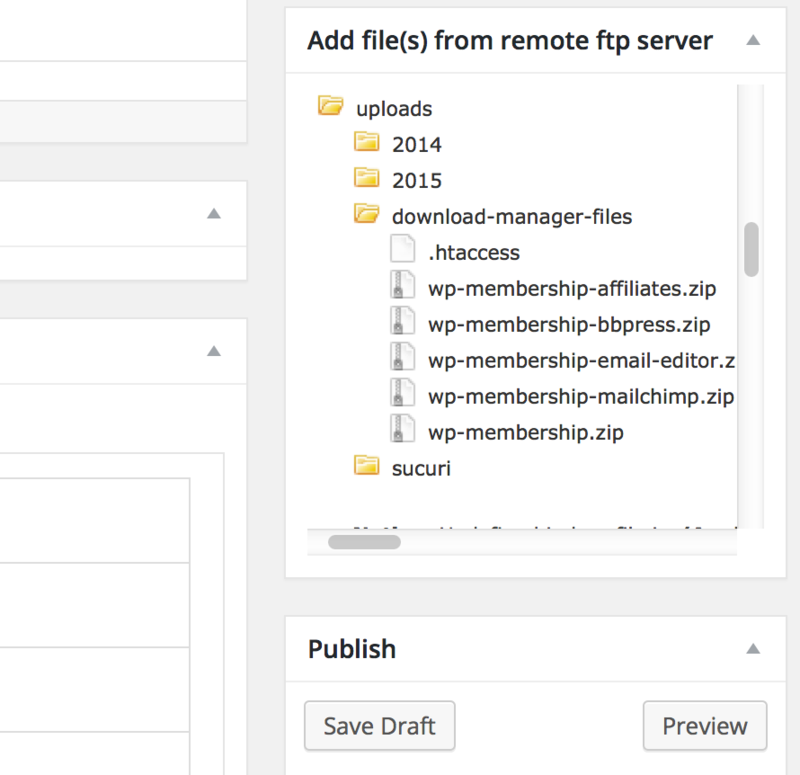 WordPress Download Manager Pro remote FTP storage add-on will help you to store your files on a remote server and add files from remote FTP location in your package. 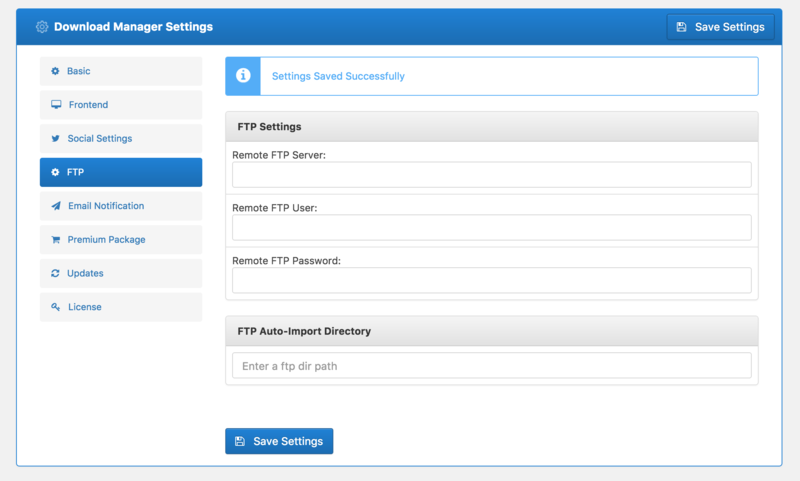 You can explore remote FTP server locations and select any file from there to add to your package. If you add multiple files with a package enable individual file download. Now the cronjob will check the CSV file every day for changes, if you add new row there or update any row, it will be imported/updated accordingly. will this add-on enable my frontside users to access files on a remote ftp-site that i set up for this purpose? No, front-end users will not have access to this add-on, But with next update we have plan to add user specific ftp access, then user from front-end will be able to use their own ftp account separately. I have installed Remote FTP add-on (the exact name of the plug-in is wpdm-ftp-file-browser.zip, included in the WP Download Manager Pro Special Pack. It works but I cannot see the field FTP Auto-Import Directory but only FTP Settings. Please download again to get the latest version of ftp add-on. The feature is available now. Can I use this plugin for a initial load of around 700 files? And then just deactivate it? My understanding of it is that i’d only have to create a CSV file and add the files to a FTP folder, and everything in the CSV file will be imported. Correct? Sorry, that will not possible, without ftp add-ons, users will not be able to download those imported ftp files. Ok, so I’d have to maintain this add-on for it to work. You need to keep it active, but probably in future update it may work in the way you are trying. After using the url to import, everything works fine. for everyone of the files. To solve this I have to enter each file and update it, this creates a master key (which is blank when I open it for the first time). 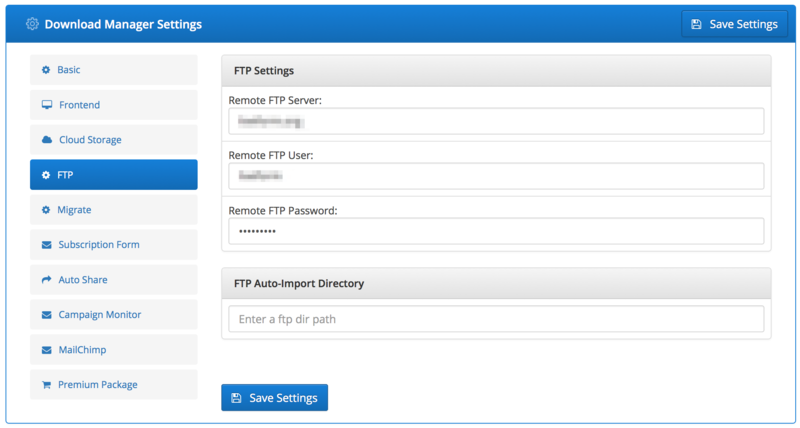 How do you refresh a remote FTP? I did a test and now switched to the final FTP, but the old one is still being loaded. Can the add-on calculate package size ? No, it can’t. You need to enter file size manually.